Our bestseller—now better than ever! Enhancements to our regal replica of an antique corkscrew promise years of effort-free openings. 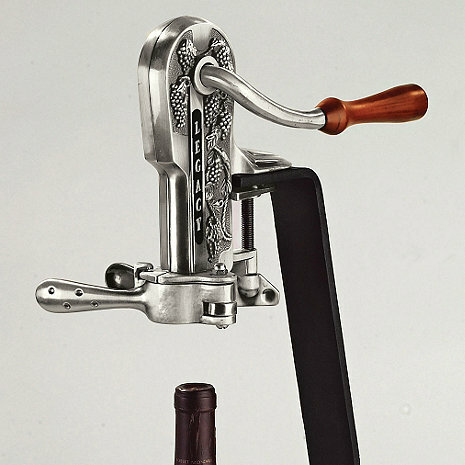 Combine the look of an antique wine opener with modern convenience. A smooth-gliding, Non Stick coated worm removes corks (natural and synthetic) with a simple pull of the handle. Inner workings and grapevine-relief casing made of lasting zinc alloy. Antique pewter finish. Mounts on your bar or our table stand. You'll be amazed at how simple it is to use our Legacy Wine Openers. .
How do u replace the worm on the legacy corkscrew. Mine is definitely "screwed"! BEST ANSWER: Cindy, WineEnthusiast sells a replacement worm and also provides a manual (pdf file) which provides detailed maintenance and repair directions with pictures. I find this manual very helpful. I recommend contacting WineEnthusiast by phone or by accessing their website and check under "Buy Wine Accessories. Hope this helps. I love my Legacy corkscrew and so far, it works beautifully. I assume you need to replace the "worm" in the head. Mine also needs this done. I need repair parts, the nylon guide? BEST ANSWER: I don't know what the nylon guide is so I can't answer your question. But I will tell you that this product didn't work for me.. It broke down. They were more than accommodating & sent me a replacement but it didn't hold up either. Too bad because it looked beautiful on my wine bar. I don,t understand the question. where do I find the legacy cork screw guide slug? The video states that the Legacy may have trouble removing synthetic corks, yet the description states that it removes both natural and synthetic corks. How well does it perform with synthetic corks? BEST ANSWER: HI Mary, I haven't had any issues with it opening synthetic corks. However, I have had issues with the device simply breaking in a short period of time. I replaced mine 3 times and this last time have simply given up. It still looks great as a piece of decor but in my opinion, the quality is poor. Hope this helps. We don't usually buy synthetic corks but when we have the Legacy does fine. We have one in each of our homes, the beach, the ski house and residence and love them all. It doesn't do a good job on screw tops though. We found out the hard way when my husband was convinced he had a corked bottle. Not very well. We have had issues with this model of the Legacy corkscrew since we purchased it. The quality is not up to the usual standards of products offered by the Wine Enthusiast. I do not recommend it. Great question.. that is actually an older video for an older version. The new Legacy corkscrews should not have any issue removing synthetic corks. Thank you. We have not had any trouble removing synthetic corks and have used the Legacy for 25 years replacing the top system once. I have not encountered any difficulty with synthetic corks. As a matter of fact some are easier than the real thing. BEST ANSWER: 24" counter to top. You also need room to spin the lever up and over to open the wine, but it can be pulled out from under the counter to do that. The Legacy Corkscrew (antique Pewter) is 24 inches in height, from the base to the highest point. 30" when the handle swings up. How do you replace the legacy cork screw worm? I have had the cork screw for 2+ years and have not needed to replace the worm. How thick does the bar edge have to be to mount the Legacy Corkscrew? How high is the Corkscrew with the stand? BEST ANSWER: Thank you for your inquiry. To mount the Legacy to a bar, the thickness of the ledge would need to be at least 2" thick. If you have any further questions, please feel free to reach out to us at 800 356 8466. Thank you again. A bar with a normal 1-2" thickness should work. Used mine a couple of times with no issues. Now it will not remove a cork. Not sure what happened or how to fix it? Thank you Sarah. Customer service was exceptional. Does this come in antique pewter with the granite stand? BEST ANSWER: Im sorry as of right now we do not offer the set of the Pewter corkscrew with granite stand. However if you wanted to place an order for it a la carte that would work. Bare in mind that the corkscrew will have a birch handle. BEST ANSWER: Thank you for your inquiry. For the best assistance, please call 800 648 6058 and Customer Service will be more than happy to assist. Thank you. Sorry to hear that. Please contact our customer service department @ 1-800-648-6058 so we can resolve this problem for you. I was given this corkscrew for a gift but had a friend use it not realizing the previous cork had not been removed. The net result was the actual cork removing screw was broken. I need to buy a new screw it is/was about 3 inches long and is easily removed. Thank you for your assistance. I need a Guide slug part Number 225 for a Legacy estate wine opener, where can I get this part? replaced for a third time, broken again. Time to move on to a different opener. The stand is great though it has outlasted three openers. Proud to give this as a gift! I have owned a Legacy Corkscrew and stand for over a year, and use it a lot! Until someone mis-used it by pulling the lever down and then thinking they should put the lever back, I had no trouble with it. Pushing the lever back with the bottle still in the clasp forces the cork back into the bottle and the stress damages the internal workings of the worm guides. You might want to include a warning to this effect in the package. I still love this corkscrew! Very quick and easy to use. Already purchased another one as a gift. My friends are jealous! We have a bar in our basement and it not only comes in handy, but looks beautiful on the bar. This is a great way to open wine bottles. We have it mounted on the available stand. We bought the stand originally and used it so much we needed a new opener. Bought the opener and put it on the stand we have. A beautiful addition to my wine room. The corkscrew and stand are so cool. Looks great!!! arrived quickly = no problems. Nice looking opener. Goes well with my Wine Bar. I was disappointed that the opener does not fit thick countertops. I hoped that the clamps would open wider. I was forced to purchase the stand for the opener, which takes up counter space. A very stylish bottle opener to replace our prior broken one. This is my second Legacy corkscrew. The first one lasted 28 years and as the son of Italian immigrant parents, much wine is consumed in my household. In other words, this is an excellent product. I HAVE BEEN PURCHASING PRODUCTS FROM WINE ENT. FOR OVER FIVE YEARS AND NEVER HAD A POBLEM . The corkscrew works great and looks good. My only issue is that there was supposed to be two rubber pads supplied to be used between the clamp and the mount stand. One was to have adhesive backing and the other without. Our unit only had one pad, the one without the adhesive. I had to mount ours using the old pad from the previous corkscrew. Other than that, great unit. This is my 3rd one, unfortunately this is a replacement to one that the inside shattered and we were unable to repair. But I still have my original one after 35 years, and it's used regularly. This wine opener has been my go to wine opener for gifts for years. Can't go wrong with this one. I purchased the Corkscrew without the stand. It fits perfectly on our granite bar, does not move around when in use, and is certainly pleasing to the eye. I have bought these for all my wine lover friends - they love them as much as I do. I have been using the corkscrew for about 6 months now and it works flawlessly. No problem with synthetic corks, although you can tell it's synthetic because of the increased force needed to insert the screw. It's not an issue due to the long lever. I purchased it with the engraved stand and am quite pleased with the combination. This is our 2nd one. After many years of use, the first one broke. We have he new one mounted in our bar/kitchen. We like it so much, we gave each of our two children one, with stands. Owned the "Estate" version for over 15 years, before wearing it out. Purchased this one because of finish--wanted something different. The stand is a must. Great product and fool proof. Excellent quality, my favorite opener! Sturdy. Easily opens all wine bottles. This corkscrew is pure quality through and through. Best I've ever used and well worth the money. Looks great too! it needs an instruction manual to get started but it is easy to use. This was the perfect addition to my basement bar! Openers don't get any better than this! I bought this to replace one that broke and it works better than the original. This was purchased to replace a cheaper unit that had a broken handle from being knocked over. This unit is well built and works great. It fit perfectly on the granite engraved base from the previous unit. Should last the rest of my life and then some. Satisfied my " I want!" I have wanted one of these for years, but felt that I couldn't afford the cost of such a frivolous luxury. Now the cost is down and I'm delighted with my inexpensive purchase! A must have for any wine enthusiast!!! No fuss, no mess....a perfectly corked bottle of wine everytime. My husband bought two legacy corkscrews, one for the house and one for our winery! We love them! The Legacy Corkscrew is great looking, high quality, and works great. No waiting to pour the wine with this guy! Works smooth and easy and fun to use every time one gets a chance to open a bottle. Excellent quality. Just as hard to use as original. This was a replacement. Great quality for the price compared to similar options. Five stars if it could open 2 bottles at once. I find this most helpful when entertaining. Whether several bottles need to be opened at one time or I simply want to move quickly from opening to paying attention to my guests, this corkscrew allows me to make quick work of opening my wine bottles. Rarely do I have a problem with corks. The exception would be aged wine (10+ years) and sparkling (yeah, I should have known better). The downside to these mounted openers is durability. This is my third one. They seem to only last a year or two (estimating 200 to 300 bottles opened over the lifespan). However,I did not hesitate to replace each time. This is an attractive unit so I decided to buy the cheaper model as repairing my old one just wasn't cost effective. Has a hard movement to it almost like the lever gets stuck. This model does not attach to the counter securely. Unlike the previous model. makes opening wine easy and looks great. Strong peice of gear. Works through stuburn corks with easy. Appearance is sharp with antique looking finish. We had one of the orginal Vintage openers for over 10 years. Had to finally replace. The new version does not seem to be as well made, but overall functions as expected. Rarely gets the cork out on the first try. Have to attempt multiple times for proper outcome. The inner gripper disintegrated after only 2 years of use; requiring a replacement part. We use this opener frequently and expected it to last forever. Corkscrew did not open even the first bottle of wine. Punched a small hole in core, then jammed. Completely useless. I would never purchase this again nor recommend it to anyone. Decorative, but does not perform well. Purchased the product in late March and have used it regularly until this past weekend, May 1st. The gear movement is jammed and will not open a bottle. Frustrating given the cost. I will not purchase another one like this. Too bad, as it looks nice on the counter. I really liked this wine opener for its looks and ease of use. But my wife gave it to me for Christmas and it is already broken after less than six months. A piece of metal fell out of it and now it does not extract corks.